Astronauts' meals have come a long way from the freeze-dried powders and semi-liquid pastes of decades ago: now US scientists want to grow vegetables in mini-greenhouses on the Moon. Although space fare has steadily improved over time, a team of scientists says the best is yet to come. They look forward to when residents of future lunar or even Martian outposts can dine on luxuries such as fresh vegetables. 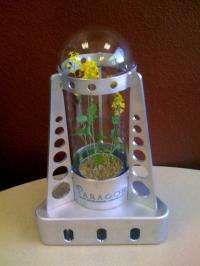 Paragon Space Development Corporation has unveiled what it called the first step toward growing flowers -- and eventually food -- on the Moon. Paragon, an Arizona company that has partnered with NASA in previous experiments on the Space Shuttle and International Space Station, calls it a "Lunar Oasis". This is a sealed greenhouse that looks like a bell jar encased in a 1.5 foot (46-centimetre) tall triangular aluminum frame. It is designed to safely land a laboratory plant on the lunar surface, and protect it while it grows. The miniature greenhouse is to be launched into space by Odyssey Moon Ltd, a participant in the Google Lunar X Prize. This competition offers 20 million dollars to any entrant who can launch, land and operate a rover on the lunar surface. Paragon officials say future testing of the "Lunar Oasis" will be driven by Odyssey's flight schedule, which will not happen until 2012 at the earliest. When it does lift off the greenhouse will contain the seeds of Brassica, a hardy plant related to Brussels sprouts and cabbage and used in the production of cooking oil and livestock feed. Because Brassica goes from seed to flower in just 14 days, it can complete its life cycle in a single lunar night. "Colonizing the Moon or Mars seems so far away, but it is important that we do this research now," Paragon president Jane Poynter told AFP. "It takes a long time to get a lot of research, and to get integrated, reliable efficient systems" before colonists move in, she said. NASA, which will retire its Space Shuttle fleet at the end of 2010, has committed to two new goals: returning astronauts to the Moon by 2020, and a manned mission to Mars by 2030. "I was pleased to see this (project) put together by Paragon," said Gene A. Giacomelli, a professor at the University of Arizona Department of Plant Sciences. "NASA has pulled back on funding for bio-regenerative life support systems, and most of the centers in the US that had been doing that research had stopped." Giacomelli and students at the university's Controlled Environment Agriculture Center (CEAC) are working on their own as-yet-unfunded lunar greenhouse. The agriculture center also makes remote operational improvements to its existing, state-of-the-art hydroponic "growth chamber" at the National Science Foundation's new Amundsen-Scott South Pole Station in Antarctica. Conditions at the South Pole, which include a high-altitude, low air-pressure environment, and wind-chill factors of minus 100 C, make the project a "good analog" to conditions at a lunar outpost, Giacomelli said. The South Pole greenhouse, now in its fifth year, allows workers living in the coldest place on Earth to dine on tomatoes, peppers, lettuce, strawberries and fragrant herbs. It produces about 27 kilos (60 pounds) each week, enough to provide each of the 75 scientists there with two salads per day. "This isn't science fiction," Giacomelli said. "We have the technology to sustain life on the other planets right now, if we could get there." There are many challenges to growing plants in space, but the biggest is finding enough water on site to support a permanent outpost. An expedition to Mars will take three years to complete, so plants must multi-task: remove toxins from the space facility air, recycle wastes, generate oxygen, provide nutrients for future crops, and produce food. "Colonies need a bio-regenerative program," Poynter emphasized. "A colony is there to stay. It's not like you can just pack up your picnic basket and go home."